The DRI-FR is a DIN rail mount, frequency input signal conditioner with 1800 Vdc isolation between input, output and power. The field configurable input and output offers flexible, wide ranging capability for variable frequency drives, magnetic pickups, turbine flow meters, and other pulse or frequency output transducers. The input of the DRI-FR can be configured for any frequency span from 2 to 10,000 Hz. The input amplitude threshold sensitivity can be adjusted from 150 mVp to 150 Vp to ensure accurate frequency measurement and minimize transient noise related errors. The maximum input amplitude is 150 Vrms. The output can be set for either 0 to 5V, 0 to 10V, 0 to 1 mA, 0 to 20 mA or 4 to 20 mA. 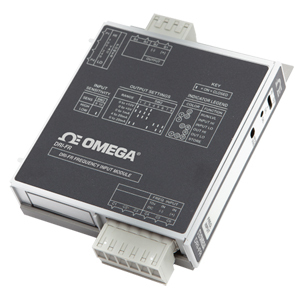 The DRI-FR can be field configured for virtually any frequency input to DC signal output within the ranges specified. There is also an 8 Vdc excitation source common to the input. This can be used as a signal source for relay contacts or as an excitation source for open collector type proximity sensors. The DRI-FR is AC powered and will accept any power between 85 and 265 Vac. The DRI-FR utilizes Touch Calibration to greatly simplify configuration. The high and low input ranges are stored in nonvolatile memory and correspond to the high and low output range which is selected via DIP switches. The DRI-FR utilizes three diagnostic LEDs. The green (RUN) LED indicates DC power and input signal status. Active line power is indicated by an illuminated LED. If the input signal is 7% or more high, the LED will flash at 8 Hz. If the input signal is 7% or more low, the LED will flash at 4 Hz. The yellow (IN) LED is lit when calibrating the input. The red (OUT) LED is lit when calibrating the output. The DRI-FR field configurable, frequency input signal conditioner is useful in eliminating ground loops and interfacing pulse output transducers, such as turbine flow meters and magnetic pickups, to data acquisition and control systems. Advanced digital technology, combined with ASIC technology, provides a stable output at low frequencies for higher accuracy, and 3-way isolation which completely eliminates ground loops from any source.